Mango, one of my favourite fruits, is in season, that makes me love summer more in Australia. Who can resist the sweet, juicy and luscious mangoes? I’ve already had several large sweet mangoes before making this cheesecake. My dad used to warn me not to have too many mangoes because they would upset my stomach and digestive system. But interestingly, I found the Aussie mangoes are not like those I had in Hong Kong that would upset my stomach. The moment I stepped into Coles the other day, the cover of their freebie, monthly magazine, really caught my eyes. It’s a photo of a double-layer mango cheesecake with heaps of mango slices on top and culis running down the edge. How could I resist the temptation? Immediately off I went to make one and brought it along to a party and shared with my church friends. That’s a big hit. The cheesecake was gone in minutes literally. My bad, I only made one layer of cream cheese. Next time, I should make a larger double-layer mango cheesecake. 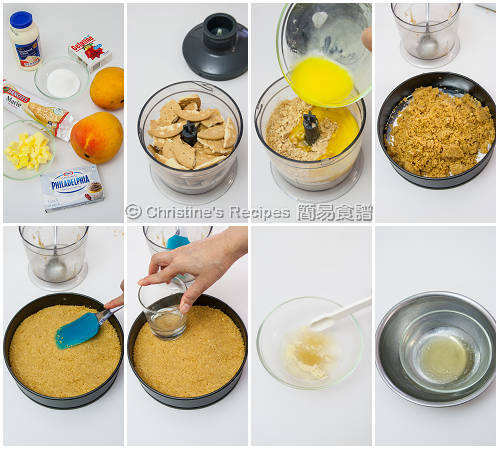 Right bottom: Place the bowl of gelatine mixture in large bowl of hot water. Process biscuits in a food processor until finely crushed. Add butter and pulse to combine. Press over the base of the pan. Chill for 15 minutes or until firm. Use an electric mixer to beat the cream cheese and sugar in a bowl until smooth and creamy. Fold in the cream. Stir ¼ cup of the cream cheese mixture into the gelatine mixture, then add to the remaining mixture and mix well. Pour the cream cheese mixture over the biscuit base. Refrigerate overnight or until firm. I used Kraft Philadelphia original cream cheese block. The thickened cream I used, is a kind of cream added some gelatin that is easier to whip and less likely to separate or curdle. You might replace with regular whipping cream if you can't find any around your area. You might replace mangoes with strawberries or blueberries. Mango coulis and slices can be prepared ahead and stored in fridge overnight, covered with plastic wrap. My favourite too! 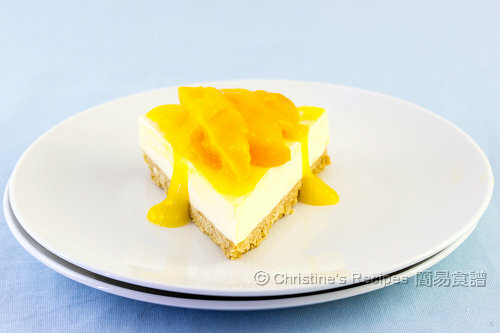 Your mango cheesecake looks so elegant and delicious, Christine. Thanks for your kind words. Mango cheesecake is definitely a winner. I didn't know you were in Australia! I am in Melbourne, I love your recipes. 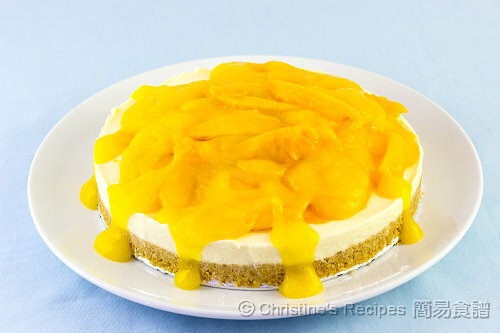 I will make this Mango Cheesecake tomorrow for my work Xmas lunch. I'm in Brisbane. Thanks for your love of my recipes. Enjoy your Christmas lunch tomorrow. I love mangoes too :) Your cheesecake looks delicious! Can't wait to try making it, since it's mango season. I tried making a mango mousse cake the other day but didn't seem to work out that well... just wondering if you have any recipes/tips for me? Oh, maybe I can make one and share on blog next time. 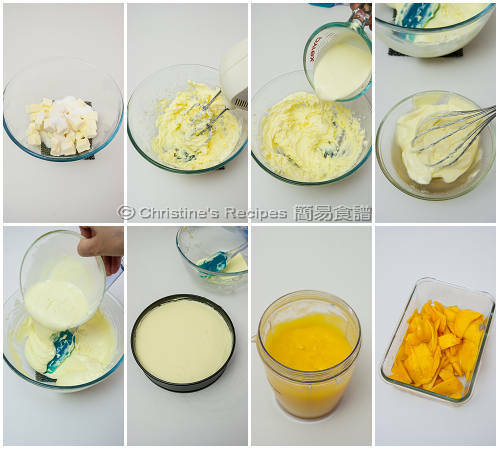 Do you want to try this mango cheesecake? How do you solve the problem of oxidation ? I tried putting lemon juice on cut out mangoes but they still turn brown. Yeah, lemon juice can help a bit but can't preserve mangoes from oxidation very long. The only way to solve the problem is to eat the cut mangoes asap. I love mango cheesecake, yummy. Great post, thanks for sharing. I've tried your mango cheesecake recipe and it was a big winner!! Just wondering if I can use this cheesecake as a base for an Oreo Cheesecake, ie substituting mango with Oreo cookies? Thanks heaps! Sure, either base will work fine. Taste good. One is baked, the other is non-baked. Oh, both are tasty with great flavours. Different base makes different textures. Hi Christine. Just recently started following your blog and love it :)! Have a qs about the cream you use. I know you said we can substitute the thickened cream with regular whipping cream. So when we substitute should we use same amount of whipping cream? Also, should we use the liquid whipping cream or the already made whip cream, like kraft's coolwhip, which we don't have to beat or anything? Use the same amount of liquid whipping cream, not the whipped cream. What's the difference between whipping cream and thickened cream. Noticed some unbaked cheese request for whipping cream while others request for thickened cream. Pls enlightened. Thickened cream has got thickening agent inside so it'd easily set. Watermelon has got too much water inside and will mess up your cheesecake. The cream cheese has already been beaten, so you don't need to beat the whipping cream as you want the texture to be too fluffy. Hey christine. 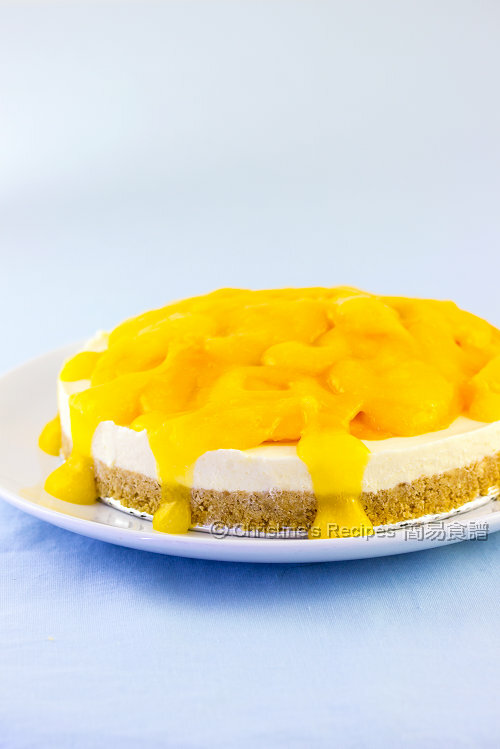 Can i make this cheesecake without the mango? Do i need to reduce or add anything? Do you mean you want to skip the mango topping? Sure, you can. It doesn't affect the cheesecake at all. Hi christine. Just wanna check how long can the cake last in the fridge after being made? If without the fruit, the cheesecake can be kept in fridge for a few days even up to a week or so. Hi Christine! Did you used Bulla thickened cream? Sometimes I use Bulla. But whichever brand will work as long as it's thickened cream. That's wonderful. Thanks for letting me know that you and your family loved it. I also made this cheesecake for gatherings. It's always a big hit. Owwww I cannot wait to try it. I've made it tonight and waiting for it to set overnight. Already made the coulis and only need to cut the mango slices tomorrow so it's fresher. Hello... I made it and it's soooo yummy. It was a big hit for my family. Even grandma ate the whole slice to herself. Glad that you and your grandma loved it. So happy for you too. Congrats on your success. no need to whip coz dun want mixture to be too fluffy. am i right? Please enlighten coz i want to learn. I have two failures with my cheesecake recently...cannot set not using your recipes though. thanks so much! Oh, the footnote just explains what contains in thickened cream and it won't separate or curdle if you whip it. For making this cheesecake, you don't need to whip the thickened cream at all, just combine it with the cream cheese mixture. Hi! Wanna ask if I can add mango puree & a lil lemon juice into the cheese mixture?if so,how much should I add? Sorry, I didn't test this recipe with mango puree. So, can't give you exact amount. For the lemon juice, normally it shouldn't go over 2 teaspoons as the cream cheese has got a tart taste in it already. Is this baked cheesecake? Why it didn't put into the oven? It's not a baked version. There are two different ways of making cheesecakes. One is baked, another one is non-baked. You might try to make both. Both of them are delicious. Can i replace gelatin with ovalette with the same amount of gelatin? I haven't experimented this recipe with ovalette. So can't tell. Sorry. Hi can I know if the coulis should be poured on the cake after putting the slice mangos or just pour it when the cake is served? Thanks! If your cake is being served very soon, say within an hour or so, then pour the coulis right away after putting on the mango slices. If not, store your mango slices and coulis separately. Put them on when served. 2 tsp gelatine powder = 10g? 2 tsp gelatine powder = about 6 to 7 grams.